I have the EVGA RTX 2080 Ti XC and am having a weird issue where Fan 1 will suddenly go to 4100+ RPM. It seems a little random but happens around 80C. I have tried setting my fans to a fixed % and Fan 1 will still raise to 4100+ RPM. I've attached a screenshot of Precision X1 when it was happening. You can see Fan 1 is at 4120 RPM while Fan 2 stays at the fixed 71% I manually set. This seems to be an extra fast RPM because when I set my fan to 100% both only run at 3500 RPM. I ran the MCU flash tool and Precision X1 then upgraded the BIOS again and it's still is having this issue. Anyone else experiencing this with their 2080 Ti? What PCI slot do you have the GPU plugged into? Are you 100% positive you've updated all of your PCI controllers etc? Have you checked your fan speeds in any software out side of X1? When you set Automatic control and load a fan curve does this problem still occur? 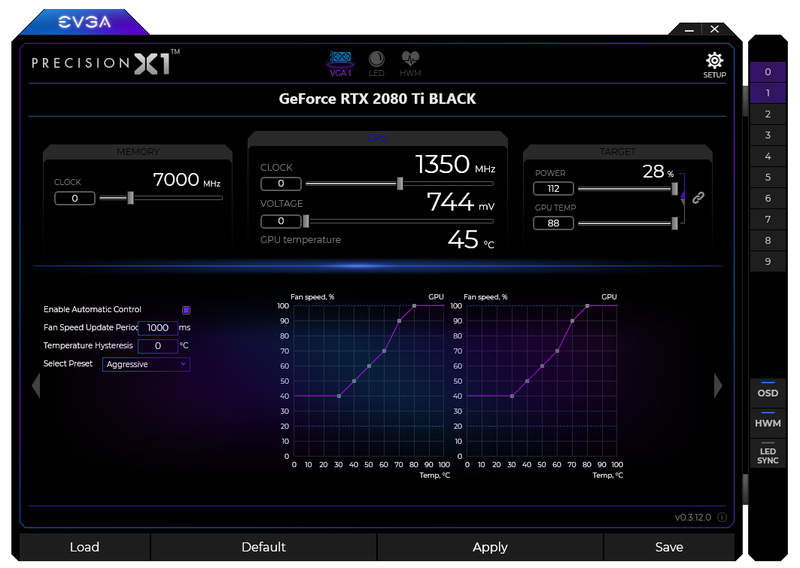 A few others using EVGA Precision X1 have reported the same thing at around the same temperature. It seems that a fan profile bug exists in the Precision X1 software. I am not having luck finding the other reports of the same issue. I think it was 3 to 5 weeks ago and I think that there were 2 separate threads started around the same time for the same problem with multiple people confirming in each thread that they observed the same problem behavior. Does the issue continue to happen after removing px1 from your computer, and rebooting the computer? Thanks everyone for the replies. I just uninstalled Precision X1 and swapped out the two 8-pin power cables. I used two black cables from another EVGA PSU because I didn't like the red ones that came with the PSU. I tested with Total War Warhammer 2 and unfortunately had the same issue. I monitored the RPM with HWiNFO64 (screenshot attached) but it's quite loud when it spins up so I can hear it easily as well. The GPU plugged into the first PCI slot (closest to the CPU). I don't believe I've updated the PCI controllers. Are you referring to updated drivers for these? Would these be intel drivers part of the chipset install? I have the Asus Maximus XI Hero motherboard and do see a chipset update from 2/12/2019 so I will install these and see if that fixes the problem. I've checked fan speeds in HWiNFO64 and sometimes use Afterburner but it doesn't show fan speed. I also ran Asus Fan Xpert 4 but I didn't see anything for the GPU. Yes I created a custom curve and tried the the Aggressive predefined profile and it still exhibited the same sudden high RPM on Fan 1 issue. Yea run those chipset updates - go on your steam ( im assuming you have that ) install some software called driver booster 6 - it's solved a lot of problems for me in the past - you don't have to use it to install anything - ( use it as a reference ) but if you do make a windows restore point first. This way we can say for sure your systems up to date, and good to go with the new hardware. Thank you so much for the help! I downloaded booster 6 and installed a bunch of Intel drivers it was recommending. I also updated my bios even though I just updated it earlier today there was an even newer version not sure why it didn't update it to that the first time. But either way one of those things might have done the trick! Because I just played Warhammer II for about 3 hours and it didn't do it once. In fact looking at HWiNFO64 the max RPM it reached was 2691 on both Fan 1 and Fan 2. So fingers crossed it doesn't crop up again! Yep figured that was the problem, new hardware so venders had to update all of their driver packages etc. Windows doesn't do a good job at keeping up :P Feel free to mark it as the solution if you can :P if they have anything like that lol. I'm able to reproduce it a lot if I raise the Power limit to 130%, at this power limit Fan1 and Fan2 both will suddenly spin up to 4100 RPM even with my fans manually set to 80% (2800 RPM). And the temperature doesn't reach 80C, below is a screenshot from Precision X1 showing the fans and temperatures. Perhaps the card is performing as it should and something is getting too hot or when a total power % is reached the fans are designed to ramp up to 4100 RPM? Even though when I set the fans to 100% it's only 3500 RPM. That's why this 4100 RPM is so concerning. Anyone else have an EVGA RTX 2080 Ti XC GAMING they can test by setting power limit to 130% and see what their fans RPM's do? Think I should open a trouble ticket to EVGA and get their take? Think I should open a trouble ticket to EVGA and get their take? Sounds like you're gonna need to. Thanks for replying @mellor28. Do you also have the EVGA 2080 Ti XC Gaming? What are the RPMs of your fans? Do they go higher than the 3500 RPM 100%? The issue with my card is it will occasionally jump to 4100+ RPM on Fan 1 but Fan 2 will exhibit this high RPM as well if I push the power target to 130% in Precision X1. I opened a trouble ticket with EVGA and they asked me to change the PCI-E slot and if possible try it in another computer. I installed the card in my work PC and it exhibited the same behavior so it's definitely something going on with the card nothing to do with my particular setup. EVGA support said if that didn't work it would need to be replaced. So I will go through the RMA process and report back once I get a new card. The interesting thing will be if the new card exhibits the same behavior and if it does then I can assume the cards are working as designed and something is getting hot inside so it ramps the fans up super fast to cool it down. I would hope EVGA support would know if this is normal behavior for the card before asking me to RMA but you never know how informed they are on the super technical details of the cards. If the new card does have the same issue I know I can run the card at 90% power target and it won't exhibit the issue. So I guess I can just set my power target to 90% permanently which feels bad because I know I'm missing out on some performance but I would prefer this to the fans randomly blasting at 4100 RPMs. No i have RTX 2080 xc my rpms are just fine until card hits 80C and then Fan 1 starts to go crazy 100% until it cools to 79. It keeps repeating of course when playing ultra 144hz monitor unlocked fram rate. So as you can imagine fan goes on and off all the time when card is under heavy load. I recorded this behavior an sent it to evga. They approved my RMA and sent new card..I'm currently waiting on it and be interesting to see what the difference will be. I doubt it will be any difference. I suspect until they release better bios it will keep happening. So if new card no luck I will try to invest in better airflow maybe more quality fans in my case maybe I will think about applying better thermal paste on the card (but it's really not what I want to do) I expect from such a expensive card to run ok not behaving like this being locked at 80C. Precission X1 software has its setting where you can set the temp card to 88. Maybe I just need 2+- degrees more room nothing else to prevent this. I used to own 1070, 1080ti in same case and none of the card behaved like this. These were not evga brands. Card runs great my framerate is amazign every game launches no freezes no surprises but this noise is heard even with quality headphones and it is ruining my gaming experience. I will report back what the outcome will be with new card. Ah interesting so I think the problem you're having is a little different then my issue. Have you tried setting the fans manually to like 80%? Do they still ramp up to 100% at 80C? You could try to lower the power target % to like 90% and see if that keeps the temps down. You'd lose some performance but at least it would be quieter and cooler. Are both of you using Precision X1 to set fan speed? If so, look back again at post #3 above, and see if the problem magically goes away if you uninstall Precision X1, reboot, and use MSI Afterburner instead as necessary. Hi Ty thanks for the idea, unfortunately I already have tried uninstalling Precision X1 and the high RPM issue still happened for me. But definitely worth a shot for mellor28 to try as well. I can happily report that it was a card. Got my replacement today did few tests. My new card never reaches 80C anyway but I adjusted manual fans just to see what would happen. And guess what card can go up to more than 80. I turned it off after it reached 84 so I don't damage my card. My overall temps are lower than before and my fan spinning problem is gone. Fans are spinning the way I set them finally. I even tried VF curve card overclocked itself lightly still I don't go above 75C. I'm glad I asked for replacement as messing with the old card drove me crazy without any resolution. Wow that's awesome Mellor thanks for the update. I did cross ship and my replacement is scheduled to arrive tomorrow so I will let you know if this new card doesn't have the same issue as mine, fingers crossed! Ok got my replacement EVGA RTX 2080 Ti XC Gaming and so far I haven't been able to re-create the high RPM issue even if I set power limit to 112% It has done a flicker black screen 2 times while I was testing it with Warhammer 2 so hopefully that isn't a new issue with this replacement card. I could always try a different display port if it starts to happen more often but I've tested it for about 3 hours and it only happened 2 times. I've been comparing these two cards and one difference I've noticed is the replacement card definitely runs hotter then my original card. And looking at the voltages the new card seems to be around 1V and my old card seems to run closer to .95V so that would probably explain why my old card is running cooler. And perhaps that is what's causing the fan issue, maybe there is an issue with the VRMs on my old card. This replacement card also has VBIOS Version 90.02.0B.00.75 with a maximum power limit of 292 Watt (112%). I had updated my original card to 90.02.0B.00.E5 so the maximum power limit is 338 Watt (130%). I was tempted to upgrade the VBIOS of the replacement card to see if that would cause the high RPM issue but I'm nervous to do so because I'm not sure if it's possible to flash back to an older version if it does cause the same problem. I also ran the Shadow of the Tomb Raider benchmark and the replacement card score was 9% higher, so perhaps my performance was being impacted as well. So from my testing with the replacement card thus far it seems there was an issue with my original card but I will keep testing and will post if anything else interesting happens. I'm not sure if it's possible to flash back to an older version if it does cause the same problem. Interesting the program to update the VBIOS is just update.exe so the bios must be embedded in the exe so I guess I would have to get the older exe file or does EVGA ever release bios files and have an app you can run to flash the GPU? You'd just have to use gpu-z, or nvflash to backup your original vbios before updating to a different vbios. Nvflash can reflash the old one back when needed.